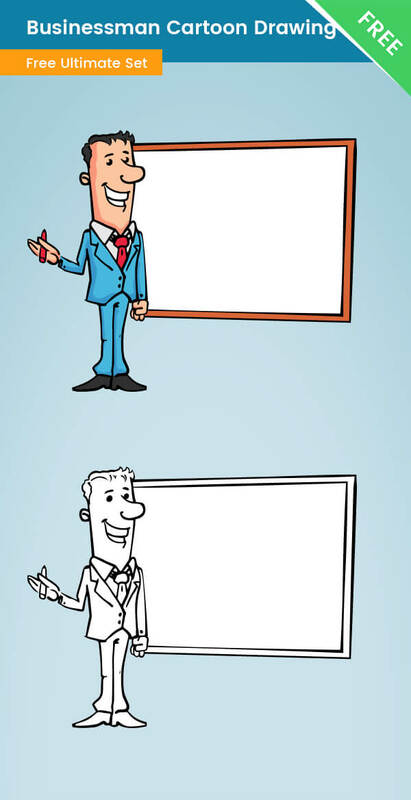 A businessman cartoon drawing made in both black and white version and a colored one. This cartoon businessman art is available for free download. This businessman is dressed in a suit, he is friendly and smart. He is standing in front of a presentation board and writing new business ideas for your clients. You can use the whiteboard as a place to put your logo, or some text and grab the attention of your visitors. This illustration is made for business-related projects, and it will fit your design perfectly. If you are not sure about the colors – you can use the included vector files in the .zip and change the colors as you want.